Eden Valley-Watkins junior Olivia Kuechle finished 93rd at the State Tournament Saturday. Kimball senior Libby Yozamp finished 103rd. Both represented the EV-W/K cross country team. Photos courtesy of Zya Lueders. 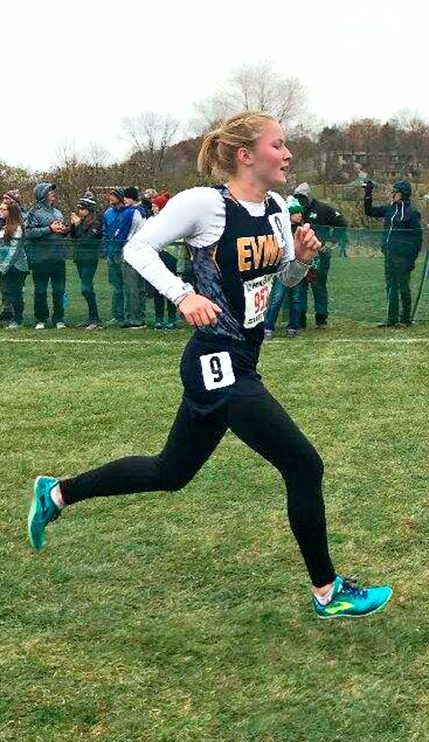 EV-W/K cross country runners Olivia Kuechle and Libby Yozamp competed in the MSHSL State Cross Country Championships Saturday, Nov. 3, at St. Olaf College in Northfield. Both girls posted very respectable marks: Olivia (93rd) 20.40, and Libby (108th) 20.54. 1 Grace Ping, Cotter, 17:19.40; 2 Lauren Ping, Cotter, 17:41.50; 3 Morgan Gehl, Murray County Central High School, 17:53.90. Team Finishes: 1 Perham High School, 94; 2 Howard Lake-Waverly-Winsted, 99; 3 Cotter, 140; 4 Luverne, 147; 5 Staples-Motley, 176; 6 Lake City, 198; 7 Mesabi East, 219; 8 Lac qui Parle Valley, 221; 9 West Central Area, 229; 10 Providence Academy, 255. 2 Cooper Lennox, Mora, 15:56.4; 3 Emmet Anderson, Staples-Motley, 16:07.5; 4 Brandon O’Hara, Perham, 16:11.9; 5 Clayton Anderson, Perham, 16:12.9. Dawson-Boyd, 170; 5 Nova Classical Academy, 183.